Australia, as with every other nation pursuing soldier modernisation, is seeking to integrate its soldier system and adding capability while reducing burden and doing so against a background of meeting both the requirements of current operations while transitioning to longer term, operational requirements. Recognising there’s no single, simple answer to this, the Australian Army has established Diggerworks to establish the way forward and to manage that ongoing process with Diggerworks’ role being to facilitate and coordinate the collaboration between agencies in defining and delivering soldier combat systems (SCS) capabilities. Diggerworks is one route. 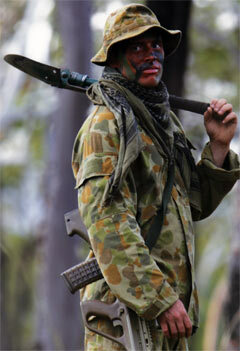 It is however designed to support the second major thrust of Australia’s strategy; the Soldier Combat Development Cycle. Together they will be used to develop requirements for those who are involved in close combat within the Brigade Rotation Model adopted by Australia with the equipment being delivered through a concept of rapid, adaptive acquisition, although this is not yet a defined term with the capability procurement system. Diggerworks is a virtual organisation but at its base is the Army’s Integrated Soldier Systems Development Directorate and also includes the Modernisation and Strategic Planning Army, Capability Development Group, Defence Materiel Organisation and Defence Science and Technology Organisation. Procurement requirements are aligned to the Army’s Force Generation model which has three phases, beginning with the Ready phase in which the brigade or elements of it are deployed on operation or at high readiness to move, moving to a Rest phase then a Readying phase where new equipment and modifications to the soldier combat systems takes place. These modernisation concepts will inform future technologies and capabilities, notably the Land 400 project which will deliver a new fighting vehicle to the Australian Army. Once acquired, equipment can expect to be modified or replaced regularly. Col Blain explained, “We are looking at a continual enhancement approach we will want to refresh the capability based on what we see coming up from that initial planning and proposal part. We don’t need to focus too much. We will continue to develop as we get user feedback and as technology changes. We are no longer going to buy big and buy less often. We want to buy more times and we want to be able to buy those continually and continue to refresh the close combatant soldier system and then get the feedback which is critical to us understanding if the equipment is being used in the first place.” If it is being received well by the soldiers, it will progress to the next modification process. The recent deployment of the Tiered Body Armour System armour system is seen by Col. Blain as the endorsement of the methodology being adopted by Diggerworks, namely giving it to a wide range of different close combatants to get feedback on what needs to be implemented in the development, taking it past a design review board, independent trials authorities trial it to get objective feedback then getting industry on line ready to go to produce this in the number we need for the brigade going along. Australia has deployed force in Afghanistan with Crye MutliCam. Feedback is now being collated to help Diggerworks develop an Australianised pattern which will eventually become the Australian combat uniform across the board. Other priorities for Diggerworks include developing a detailed anthropometrics picture of the Australian soldier following an initial short study. Diggerworks is also helping develop an Australian standard of ballistic measurement that more closely meet military requirements. The key project in Soldier Modernisation in Australia remains Land 125 with the current Phase 3A delivering the systems Situational Awareness and communications capability 3B providing the Solder Combat Ensemble (SCE) and 3C addressing the enhanced Austeyr assault rifle. Addressing Phase 3B in which Diggerworks is most closely involved Col Blain outlined the SCE as a sub- system of the overall Soldier Combat System encompassing those items that a combat soldier wears to provide him the ability to carry equipment or provide physical protection from the environment and threats. Col. Jason Blain was speaking at Soldier Technology 2011.